Metro Research Quick Poll: Do you TAP on the bus? Plus, recent poll results! Gate latching is upon us! Whether you love it or you hate it, we’re curious if gate latching is expanding the reach of TAP cards to bus rides. Answer this quick poll, and view the results to see how other readers and patrons are using TAP cards on the bus. For results from our last poll, continue reading. With the launch of our new Metro Research Webpage, we created a quick poll to kick it off, asking simply: “What is your favorite Metro Line?” The Results are in: Gold and Red Lines are the favorite lines of those of you who visited our new Research page. A third of respondents favored the Gold Line, and as a close second, the Red Line won 31% of your hearts. The Expo line made a good showing, especially for such a newcomer, with 17% of responses. 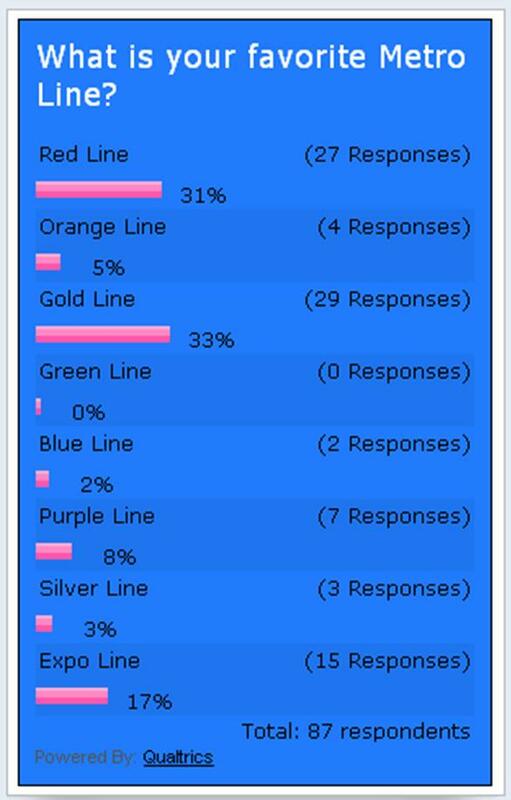 The Purple Line, my personal favorite, only racked up 8%, and the Orange, Blue and Green trailed behind further. This is contradictory to what we might expect according to ridership numbers. The Red line does get the most riders, but Blue, Green and Gold are more on par than the results suggests. Why do you think folks favor some lines over others based on more than just usage? A new poll is now available on the website. Click here to weigh in! For what it’s worth, the Gold Line goes to Little Tokyo, which is one of my favorite places in Los Angeles. But I’m Japanese American and an anime fan, so it’s not likely to fit a general trend. Gold Line is the best–fast, safe, and clean. Tagging is very minimal, and the riders are all respectful. Red Line has good stations, but the trains are soooo tired and dirty. It also needs more Sheriff presence. Speaking of which, I don’t think I’ve ever seen a Sheriff deputy on a Red Line train. Speaking of the Gold Line, I didn’t tap my card today because if I tapped, I would miss the elevator at Union Station. Metro needs to put tap card validators on ALL train platforms. Some train stations’ gated areas have no elevators. Are you going to issue citations to all wheelchair, baby stroller and cyclists who use the elevators? I take Expo to Culver CityBus to work and am surprised at how many people pay with cash after just getting off Expo or another Metro Bus [CCB is TAP enabled] and how many pay full fare for the transfer. A Metro to Muni and Muni to Metro transfer can be had at a lower cost. Does TAP do that automatically when riding with cash value? That’s one thing Metro nor Muni hasn’t been really clear on. If I TAP on the Expo and TAP on to Culver City Bus, does TAP automatically deduct Metro-to-Muni fare? If I TAP on CCB and then onto Expo, does TAP automatically deduct Muni-to-Metro? Or does it just deduct $1.50 + $1.00? Expo is great. The views south of Kenneth Hahn park as it passes La Brea are pretty cool. @Tap User, at this time you must preload a transfer for it to work. it is $.35 fro Metro to Muni and at least for Culver CityBus, it’s $.40 for Muni to other Muni or Metro. You can load the transfer at any Metro TVMs at rail stations, plus Culver CityBus drivers are adept at loading the transfers, but with Metro Bus drivers, in my experience, it’s a crap shoot whether they know how to do it. I saw mentioned on either The Source or LA Streetsblog that automatic transfers were in the works, however they do not work now. Yeah, that’s the problem. How is anyone supposed to know this? I expect TAP to be simple. I load up $100 in TAP, forget about it, TAP-in, and it deducts the value. When I TAP-in again on another agency, it deducts the transfer value. I don’t want to be bothered trying to memorize all these things like preloading transfers, buying passes, or talking to the bus driver for him/her to operate his farebox machine clogging up the lines. Every other place I visited that used contactless transit cards made it so simple to use and easy to understand. Why is it so difficult to do the most simplest of things here? @Ivan, we asked our TAP group about your comment, and they tell us that all of the platforms have access. Some only have access one side, but still have access. I know it can be frustrating, but sometimes you have to wait for the next train if you are about to miss the elevator. But another one will be along soon! Make sure you have valid fare when riding! “You can load the transfer at any Metro TVMs at rail stations, ” No, you can’t. You can now purchase a printed one, issued on the ticket stock that T.A.P. was supposed to replace. During your next lunch break, go down to the Union Station Gold Line lobby. Note where the elevator is. Then note where the T.A.P. validator is. Now imagine having to use both while in a wheelchair, possibly with other limb-movement issues. Now think about what the frequency of the Gold Line has been at night, and about how and where buses connect to the Gold Line for what might be the remainder of Ivan’s trip. Because waiting for “another one to come along soon” (they don’t always) may mean the difference between getting home in 1 hour or 3 or missing the last bus of the night and not getting home at all. Have you or anyone who writes for this blog ever been dependent on transit, except by choice?